Now say it aloud in a singsong Julia Child voice. 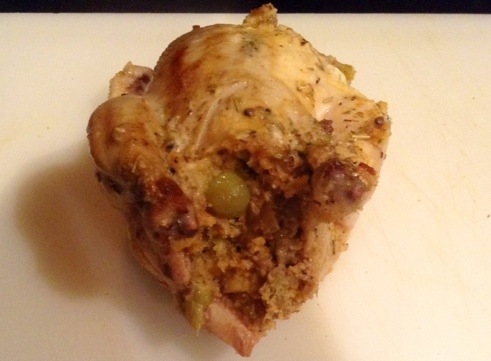 “Devonshire Cornish Game Hens with Sausage and Sage Dressing.” It sounds really good, right? Obviously, I’m not Julia Child (or some remorseless blovelist impersonator). I am, however, attempting to appeal to your senses. 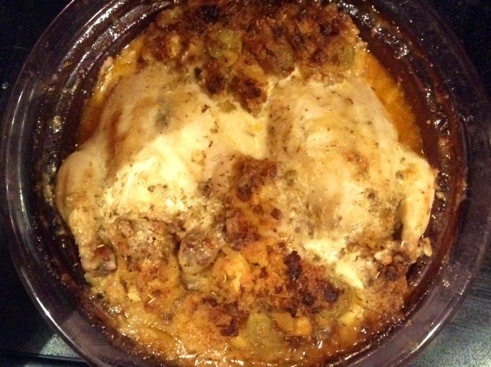 So imagine succulent cornish hens, chocked full of moist, sweet and savory deliciousness, served with a completely unnessessary (but woefully complimentary) clotted cream sauce thats been infused with a buttery chicken stock. It can tell you that this dish somehow manages to be both mild and sumptuous at once. And though my version is somewhat less providential, if it lacks English charm or authenticity, the Julia Child accent would at least give it the proper elocution (i.e., she wasn’t English either). That said, I would like to thank Cooks.com and AllRecipes.com for their inspirational recipes. Initially, I was daunted by the “Devonshire cream” this sauce called for; it sounds damn pretty geographically specific, right? (Can you even get that at Fresh and Easy?) But a little more research yielded a recipe for making the actual cream from *gasps* regular cream but maybe more importantly, I learned the origins of Devonshire Cream. Since cooking is really about the journey food makes before arriving on our plates, it seems appropriate to share it with you as well. Spoiler alert: Um…I didn’t use a centrifuge and my cream wasn’t from Devon. 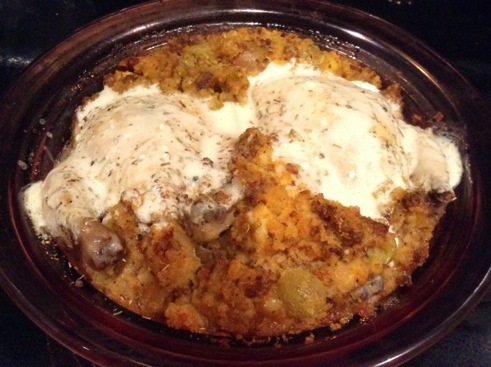 This recipe version, I can tell you was very “fresh” and was “easy.” And tasted very awesome. Presumably because you are interested, but perhaps also because you enjoy reading blogs about food you never intend to make, with ingredients you never intend to buy (which is the equivalent of going to travel sites to only read peoples’ vacation or hotel reviews) but which may, for you, be a sophomoric yet entirely pleasing past-time – you may also be keen to know in advance that EVERYTHING came out wonderfully! 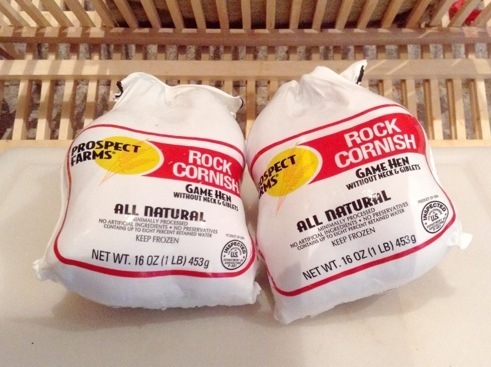 For your viewing pleasure: a picturesque representation of two un-thawed rock cornish game hens. Aww…who doesn’t like their own personal baby-little-mini chicken? Err…whom don’t like…who doesn’t like more…doesn’t whom like… *babbles* The point is, they’re delicious people, so if you came for a recipe and not an English lesson, Stay Calm and Klingon. See how I did that? Another Star Trek reference AND an English aphorism. Get it? cling…on…hello? Throughout the cooking process, I attempted to break down each individual step so that you are able to keep timing, since it’s actually three separate recipes. What isn’t shown is the final chop on the pre-sautéed vegetables before adding them to the crumbled sausage. I took for granted that everyone knows the difference between chopped vs. diced and didn’t photograph that part. Moving forward, I will definitely include all in-process images, I promise. Please forgive this humble cook. 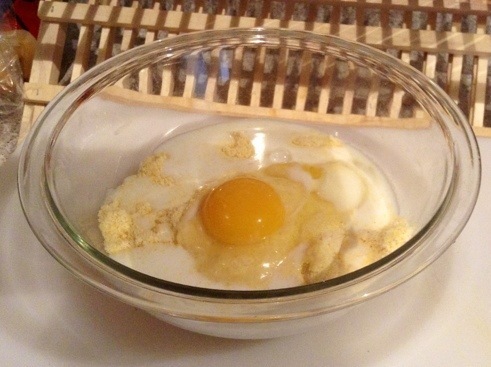 Combine cornbread mix, egg, and mild and blend until smooth. 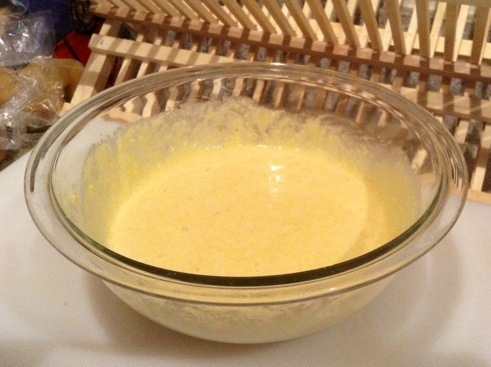 Grease a baking pan with butter, pour in the batter, and bake for 25 minutes. Melt 2 tablespoons of butter in a large skillet over medium-high heat. Add the sausage and break up with a wooden spoon or spatula. Cook until it loses most of its pink color, but not so much that it’s dry, about 5 minutes. 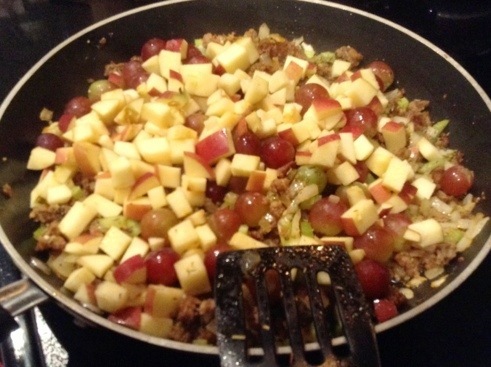 Melt the remaining butter in the pan and add the onion, celery, apple, and grapes. Sprinkle with salt. Cook until the vegetables get soft, about five minutes, then add the broth and parsley and bring to a boil. 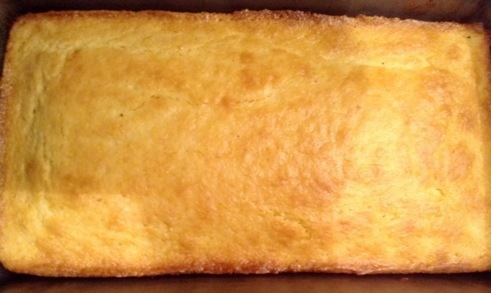 Add the sausage, vegetables, and all the yummy pan drippings into a large bowl with the fresh baked cornbread cut into squares. 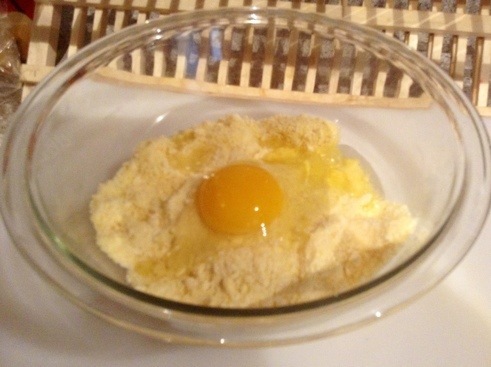 Toss evenly until evenly moistened then mix in the beaten egg. 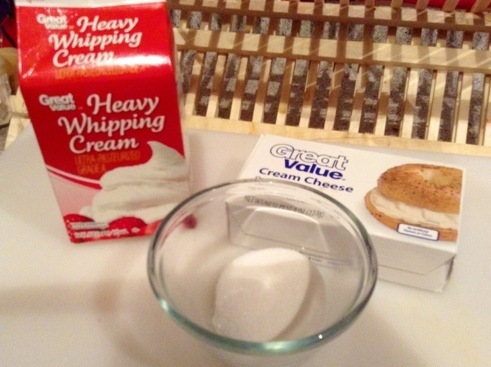 In a medium bowl, cream together cream cheese, sugar and salt. Beat in cream until stiff peaks form. Chill until ready to make the sauce. If your hens came with giblets, remove them first. (The original recipe uses the giblets to make a chicken broth which will go into the Devonshire Cream sauce: in a medium sauce cover giblets, add a pat of butter, a pinch of salt, and boil over high heat for 30-45 minutes. Add water or reduce heat if it reduces too quickly. I used simple chicken broth and butter to much the same effect which I will describe later.) Rinse the hens in cold water; dry well. Season cavities with salt and pepper. Fill each cavity with several spoonful’s of dressing. If desired, you may truss or skewer the legs, and add the remaining dressing to fill any unused corners of your baking dish. 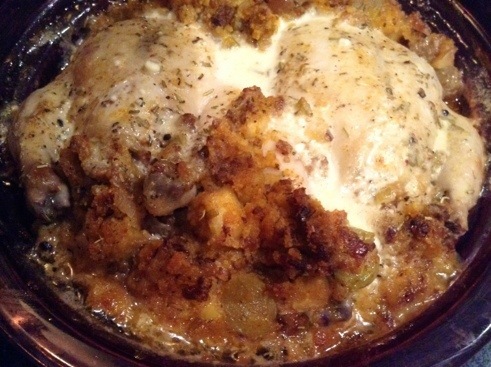 Then, brush hens with the Devonshire Cream Sauce. Roast chickens for 30 minutes; brush with sauce again and continue roasting for another 30 minutes. 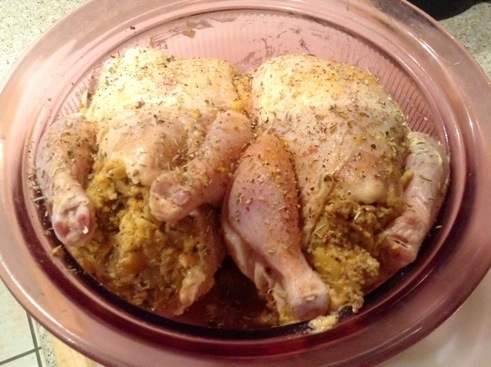 Once fully cooked, remove trussing or skewers, and remove each chicken and place aside to cool slightly. 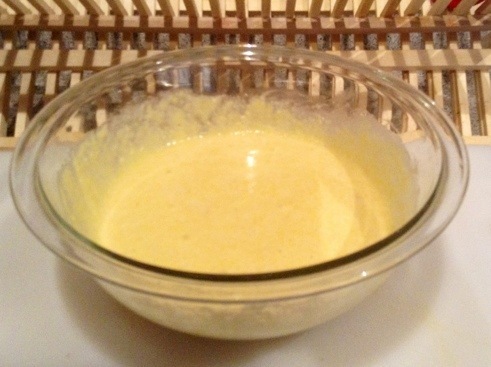 In a small saucepan combine Devonshire Royal Cream, butter, lemon juice, mustard, salt, and cinnamon. Cook over medium heat, stir in half and half. Stir constantly just until mixture comes to a boil. Remove sauce from heat and set aside. Ladies and Gentlemen, I present to you, the stars of our pageant! Remove the wrappings and rinse the hens in cool water. 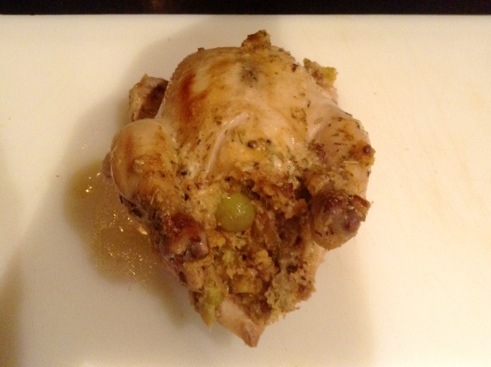 If you have giblets inside remove them and follow the recipe instructions (as above). 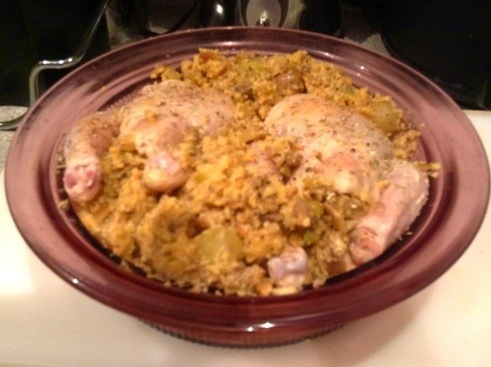 Pat dry and set each chicken into a baking dish or pan until you are ready to season them and begin filling them with your cornbread mixture. First we want to make the Devonshire Cream. You can use mascarpone instead of cream cheese; this is a less expensive alternative. In a medium bowl, add 3 oz. of cream cheese, 1 tbsp. sugar, 1 pinch of salt. 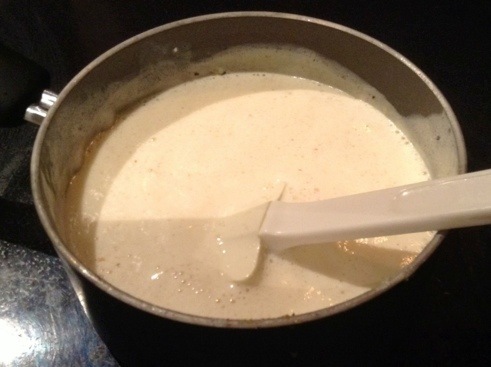 Beat in the cream until it begins to thicken, then add 1 tsp. of nutmeg and continue to beat it into submission, or until it stiff peaks start to form. 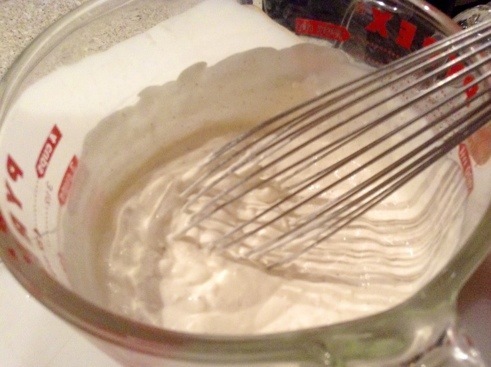 It should look like slightly clotted or softly whipped cream and should hold its shape when you remove your utensil. Cover and refrigerate. 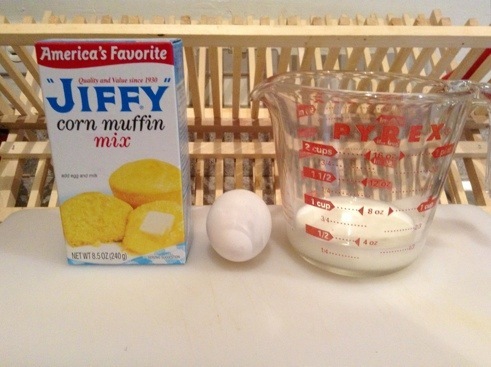 My family always used Jiffy corn muffin mix. 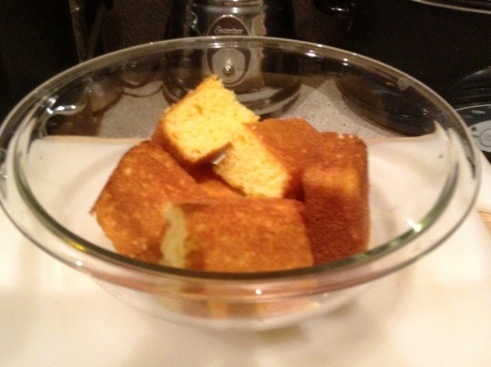 I like it because it’s not coarse or grainy – like some cornbread mixes – and it has a slightly sweet taste. But use whichever cornbread you prefer. And finally add the milk. 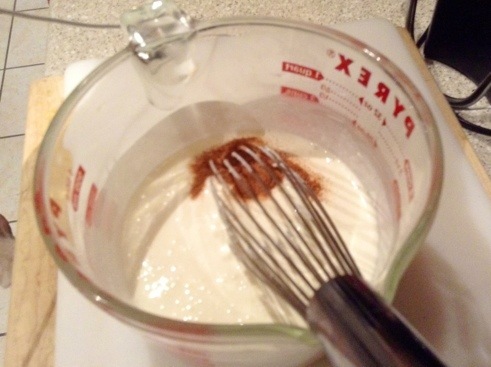 Beat all the ingredients together until your batter is only slightly lumpy. 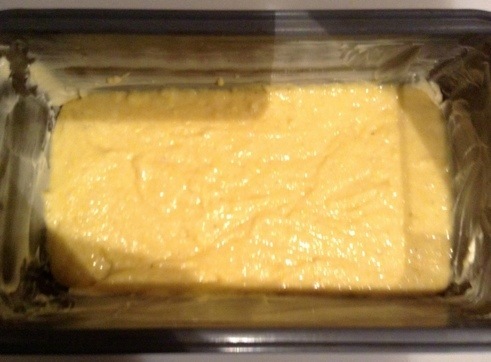 Pour batter evenly into a buttered baking pan and place it into a 400 degree pre-heated oven for 15-20 minutes. Or until it’s golden brown. 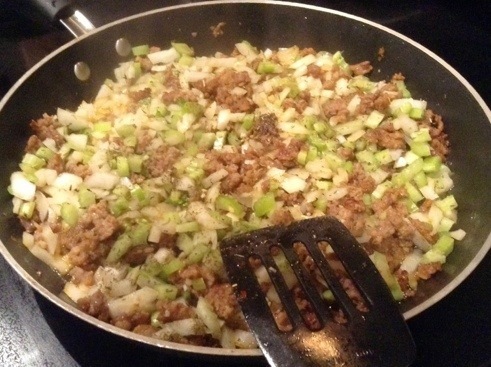 After you’ve browned and crumbled the Italian sausage (without any casings) in butter, add the chopped celery and onion to the pan. 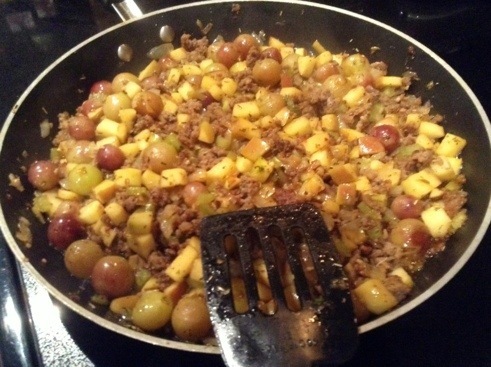 Toss in the cubed apples and onion. Cook for about 5 minutes or until your all ingredients are slightly soft. Pour in the chicken stock and chopped parsley. Continue to boil until the all the vegetables and fruit have a nice caramelized or golden color. In mid-stride, while that’s finishing, cut up the cornbread and place in a large mixing bowl. 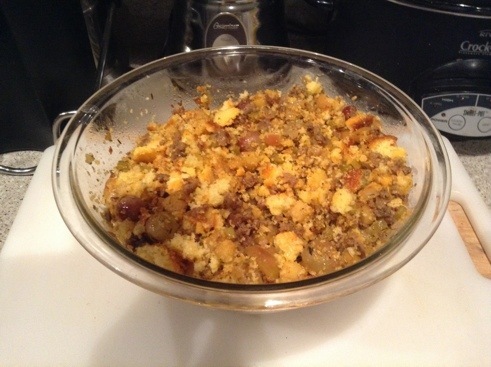 Now carefully scoop the fully cooked sage, sausage, veggies, and drippings to the cornbread. And mix until everything looks chunky but more or less incorporated. If it seems too dry add a little more chicken stock but be careful not add too much. 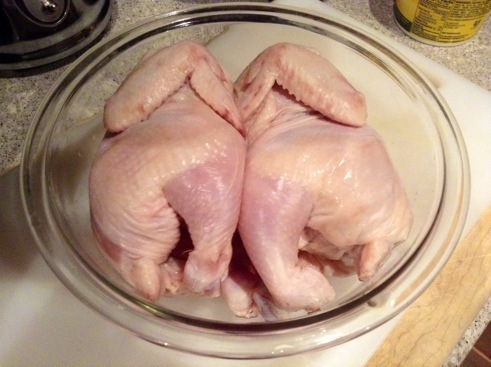 Now collect the rinsed Cornish hens and salt and pepper the inside cavities. With a tablespoon, stuff the game birds completely to the point of overflowing. 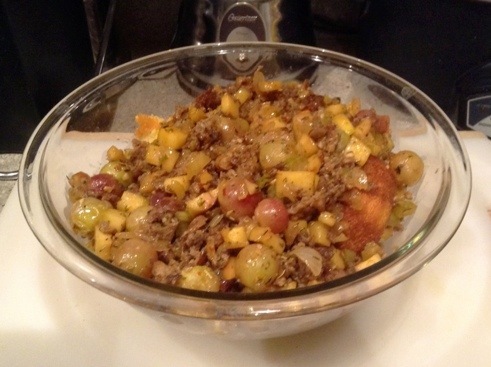 Don’t worry about the excess stuffing because we’ll use it to dress the hens in our baking dish. 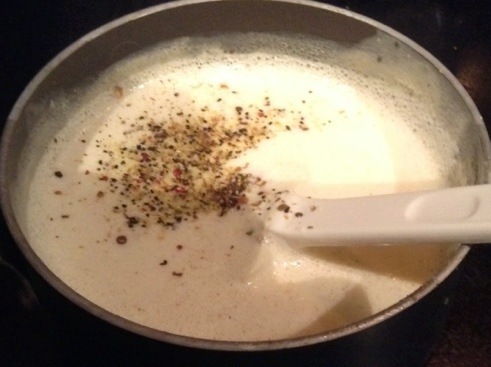 Let’s shift gears again and quickly prepare the Devonshire Cream sauce. Spatula the chilled Devonshire cream into a medium sauce pan and cook over medium heat stirring constantly. 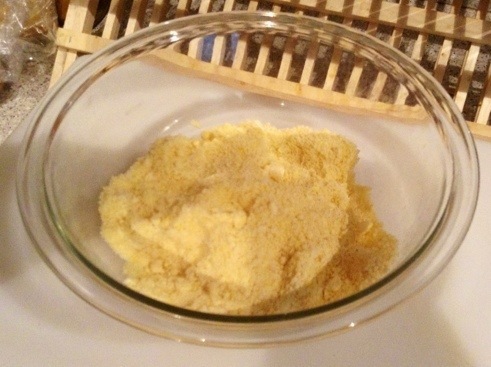 Mix in butter, lemon juice, mustard, salt, and cinnamon. Keep stirring until mixture comes to a boil then stir in half and half. Add a little lemon pepper, and once it comes to a boil again, remove sauce from heat and set aside. 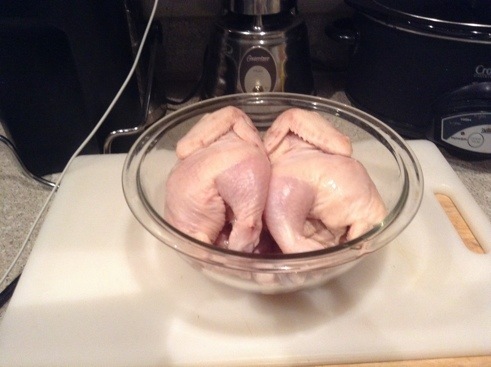 Brush the Cornish hens with a liberal amount of the sauce. Don’t fret the unsavory appearance at first. It’s all a part of the magic. Place erupting birds and stuffing into a 375 degree oven and bake for 30 minutes. Then take them out and brush on a little more Devonshire cream sauce. Look at this joyful little beauty! Nom! Now remove each hen and place on a cutting board. Split into halves, carefully removing the small spine. 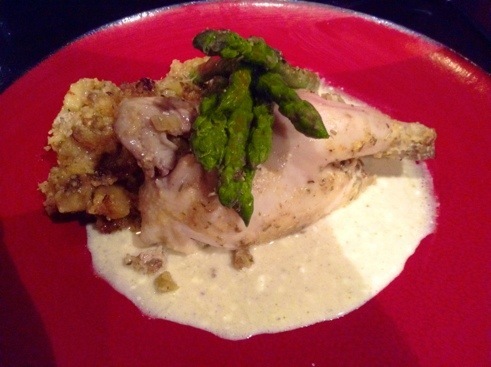 Serve plated “wing side up” on a small pool of Devonshire Cream sauce and an additional portion of the moist dressing. 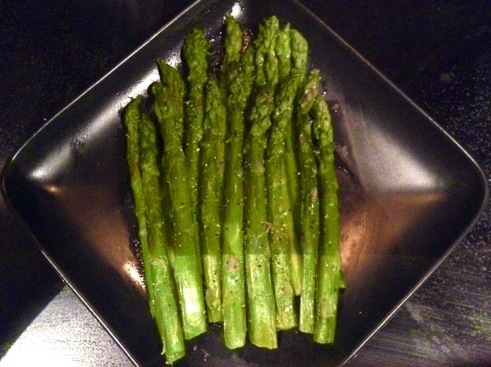 I served it with asparagus grilled and brushed with lemon and olive oil and a liberal pinch of s&p. The gorgeous final plating! 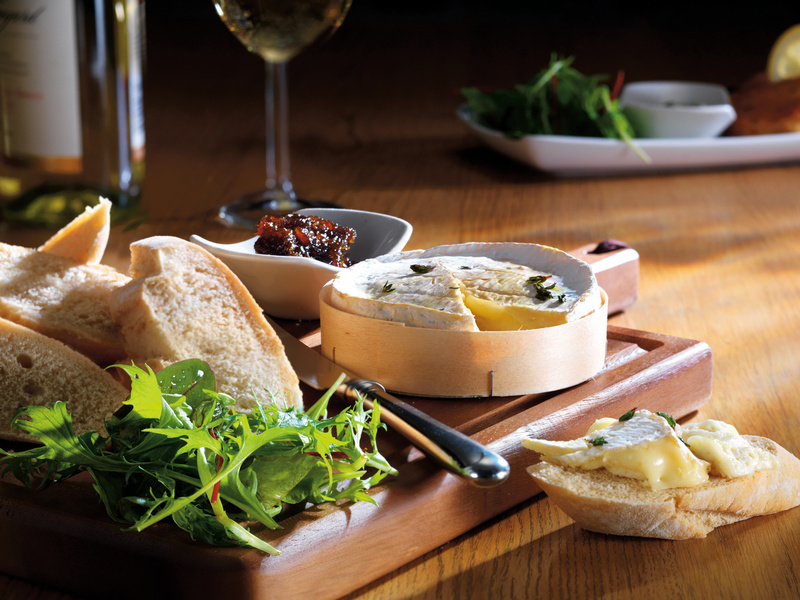 Don’t be stingy with the Devonshire cream sauce. Thank you visiting my food blog! I’d love to hear your comments and feedback!